• NBA All-Defensive First Team (2015). • Led the NBA in field goal percentage and rebounds per game for both the 2013-14 (67.6% FG% and 13.6 rpg) and 2014-15 (71.0% FG% and 15.0 rpg) seasons. Only Jordan, Dwight Howard and Wilt Chamberlain have finished a season atop the league in both categories and only Howard did so in the last 40 years. Howard did so in 2009-10, grabbing 13.2 boards and shooting 61.2%. Chamberlain accomplished the feat eight times from 1960-61 to 1972-73. Jordan and Chamberlain are the only two players in NBA history to have led the league in both categories for consecutive seasons. • Shot 50%+ from the field in 40 consecutive games (11/29/14 - 2/19/15), the longest streak in NBA history. • Set Clippers franchise record with 13 games of 20+ rebounds in 2014-15. • Set Clippers single-season franchise record with 1,226 rebounds in 2014-15. • Led the NBA in defensive win shares (5.4) in 2014-15. • Owns the Los Angeles Clippers record for consecutive games played with 322. • Appeared in 82 games (all starts), averaged 11.5 points, 15.0 rebounds and 2.2 blocks in 34.4 minutes. • Became the third player in NBA history to average 11+ points and 14.5+ rebounds in less than 35 minutes per game (M. Stokes- 1955-56 & R. Kerr- 1961-62). • Led NBA in both field goal percentage 71.0% and rebounds per game at 15.0. • Season field goal percentage of 71.0% was the second-highest single-season mark in NBA history (W. Chamberlain, ’72-73- 72.7%). • Led NBA in defensive rebound percentage (32.4%), total rebound percentage (24.5%) and defensive win shares (5.4). • Scored 10+ points 41 times, 20+ points seven times, grabbed 10+ rebounds 62 times and 20+ rebounds 13 times on the season. • Among starting centers in the NBA ranked first in blocks with 183 and third in steals at 81. • Recorded 14+ rebounds in 19 consecutive games (2/8/15 - 3/9/15), the longest streak in the NBA since 1992-93 (D. Rodman- 24). • Set franchise record for rebounds in a season (1,226) passing Swen Nater (1,216). • Recorded three games with 20+ points and 20+ rebounds in a 10-day span (2/2/15, 2/9/15, 2/11/15), after recording zero such games in his career until that point. • Recorded an NBA-leading 13 games with 20+ rebounds, the most by a Clipper in a single-season. • Recorded second consecutive season with 1,000+ rebounds and 65%+ FG%. Only he and Wilt Chamberlain (2x) have accomplished the feat. • Recorded 201 rebounds in a 10-game span (2/9/15 - 3/4/15) joining Ben Wallace and Dennis Rodman as the only players to record 200+ rebounds in a 10-game span since 1994-95. • Recorded 29 games with 17+ rebounds, third most since by any player in a single-season since 1985-86. • Shot 88.4% from the field over six-game span (1/14/15-1/25/15), the highest field goal percentage of any player in a six-game span in the shot-clock era (40+ FGA). • Finished the season as one of 13 players to average a double-double. • Tied for third in the NBA in double-doubles with 47. • Finished fourth in the NBA in blocks per game with 2.2. • Led the NBA in dunks with 252. • Led the NBA in recording 10+ rebounds in 75 games. • Currently holds the NBA’s longest active consecutive games played streak at 322. • Recorded 15+ rebounds in 10 straight games (2/9/15 - 3/4/15), the longest streak in Clippers history. • Became one of only three players since 1985-86 (A. Drummond, K. Willis) to average 16+ points and 17+ rebounds in a single month (16.0 ppg & 17.2 rpg in Feb. 2015). • PLAYOFFS: Appeared in 14 games (all starts), averaging 13.1 points, 13.4 rebounds and 2.4 blocks in 34.5 minutes. • Became first player in NBA postseason history to average 13+ rebounds and shoot 70%+ from the field in a single postseason. • 5/4/15 at Houston, tallied five assists, his most in any game of his professional career. • 5/10/15 vs. Houston, scored a postseason career high 26 points in Game 4 to go along with 17 rebounds, becoming the only player since 1985 to record 25+ points and 15+ rebounds in 30 or fewer minutes in a postseason game. • 5/10/15 vs. Houston, attempted an NBA postseason record 28 free-throws in the first half. Jordan finished with 34 attempts from the stripe, good for the second most by any player in a single postseason game in NBA history (39-Shaquille O’Neal, 6/9/00). • In 82 games (all starts), averaged career-highs in points (10.4), rebounds (13.6) and had 2.4 blocked shots in 35.0 minutes. • Was the only Clippers player to appear in all 82 games and one of only five players in the NBA to start every game. • Appeared in his 240th consecutive game on 4/16/14 and finished with the longest active streak in the NBA. • Was one of 11 players in the NBA to average a points-rebounds double-double on the season. • His 67.6% field goal percentage broke his own record of 64.3% which he set in 2012-13. • Led the NBA in dunks with 245. • Led the NBA in games with at least 12 rebounds. • On 3/31/14 had a career-high 24 rebounds in a 114- 104 win against the Timberwolves. His previous best was 22 rebounds on 2/4/12. • Had a career-high 42 double-doubles, second on the Clippers and tied for eighth in the NBA. • Grabbed 16 rebounds versus Denver on 4/15/14, marking the 27th time in 82 games that he had at least 16 boards, including at least 20 on four occasions. In his previous five NBA seasons Jordan had just seven games with 16+ boards and never did so more than three times in a single season.• Had the fifth largest improvement in rebounds per game from one year to the next in the NBA since 1951-52 (Min. 75% of team games and 7.0 rebounds per game each year). • Eclipsed 1,000 rebounds for the season on 3/27/14 against the Mavericks. It was just the 12th time since 1985-86 that a player has had 1,000+ rebounds in the first 73 games or fewer of a season and first since Kevin Love in 2010-11. Dennis Rodman (three times), Kevin Garnett (twice), Dwight Howard, Dikembe Mutombo, Hakeem Olajuwon, Ben Wallace and Kevin Willis are the others to have done so in that span... In addition, Jordan was just the seventh player in franchise history to reach 1,000+ rebounds in a season. • Led the Clippers in points once, rebounds 67 times, blocked shots 67 times and steals 16 times. • Finished No. 5 all-time on the franchise single season rebounding list with 1,114 total rebounds (No. 1 in Los Angeles Clippers history). • His streak of 22 games in a row with at least 10 rebounds and one block came to end on 1/25/14 against Toronto when he did not record a blocked shot. He surpassed Hakeem Olajuwon for the second most such consecutive games in NBA history. According to the Elias Sports Bureau, Kareem Abdul- Jabbar did so 24 straight times in 1976-77. • PLAYOFFS: In 13 games (all starts) averaged 9.6 points on 73.0% shooting, 12.5 rebounds and 2.5 blocked shots in 34.0 minutes. Set a franchise postseason record with 22 rebounds on 4/24/14 against the Golden State Warriors. • In 82 games (all starts) averaged career-highs in points (8.8) and steals (0.59), to go along with 7.2 rebounds and 1.37 blocks in 24.5 minutes. • Was one of two Clippers (Lamar Odom) to appear in all 82 games and one of only 15 players in the NBA to start every game. • His 64.3% field goal percentage surpassed James Donaldson’s Clipper record of 63.7% set in 1984-85. • Had a career-high 22 rebounds to go along with seven points on 2/4/13 at Washington. • Collected a season-high 21 points on 11/18/12 at Portland. • Had a season-high seven blocks, one shy of a career-high on 11/1/12 vs. Chicago. • Had three games of 20+ points, 23 games of 10+ rebounds and 12 double-doubles on the season. • Led the team in rebounding 25 times and blocks 37 times this season. • Finished third in NBA with 179 dunks. • Finished 16th in NBA in blocks (1.37). • PLAYOFFS: In six games, averaged 3.7 points, 6.3 rebounds, 1.67 blocks and 24.1 minutes. • Started all 66 games, averaging 7.4 points, 8.3 rebounds and 2.0 blocks in 27.2 minutes. • Fourth in the NBA in blocks per game with 2.05 bpg. • Finished season as one of only three players in NBA to average 7.0+ points, 8.0+ rebounds and 2.0+ blocks per game. • Had 25 games with three or more blocks and had 5+ blocks five times. • Registered a career-high eight blocks on 12/25/11 at Golden State. • One of just two players in NBA (Tyson Chandler) with more than 315 field goals attempted and shooting over 63% from field. • Finished third in the NBA with 141 dunks. • Clippers leader in blocks and field goal percentage. Second on team in total rebounds. • Led Clippers in blocks 42 times and rebounds 22 times. Had eight double-doubles and reached double-figures in rebounds 24 times and points 19 times. • PLAYOFFS: In 11 games, averaged 4.5 points, 5.3 rebounds, 1.64 blocks and 22.6 minutes. • Averaged 7.1 points, 7.2 rebounds, 0.5 steals, 1.78 blocks and 25.6 minutes in 80 games (66 starts). • Finished third in the NBA with 158 dunks. • Shot a team-high and career-high 68.6% from field (234-341 FG). • Owned the highest field goal percentage of any player in NBA with over 300 field goal attempts. • Ranked 10th in NBA with 1.78 blocks per game and 36th in NBA with 7.2 rebounds per game. • Led Clippers in blocks 47 times, rebounds 17 times and steals 10 times. • Had 10+ rebounds 18 times and registered 20+ rebounds once on 1/5/11 vs. Denver, had 14 points (5-7 FG, 4-6 FT), career-high 20 rebounds, three assists, six blocks in 40:54. • Recorded a career-high eight double-doubles and scored 20+ points one time, had 10+ points 19 times. • Averaged 4.8 points, 5.0 rebounds, 0.3 assists, 0.89 blocks in 16.2 minutes. • Appeared in 70 games (12 starts). • Had six double-doubles and led team in rebounds 10 times. • Averaged 4.3 points, 4.5 rebounds, 0.2 assists, 1.11 blocks in 14.5 minutes. • Appeared in 53 games (13 starts). • Scored 10+ points two times and 20+ points two times. • Grabbed 10+ rebounds six times and 20+ rebounds one time. • Led Clippers in rebounds 10 times and blocks 16 times. • Became one of only three then-active players to have a 20-rebound game in one of first four career starts, joining Shaquille O’Neal, Tim Duncan and Aaron Gray. • 1/21/09 vs. Lakers, recorded 23 points (11-12 FG, 1-2 FT), 12 rebounds, one steal and four blocks in 43:14. • 1/25/09 at Golden State, had eight points (3-8 FG, 2-7 FT) and a career-high 20 rebounds. • Early entry candidate out of Texas A&M after his freshman season. • Earned Big 12 All-Rookie Team honors. • Averaged 7.9 points, while leading the team with 6.0 rebounds, 1.3 blocked shots and 61.7 field goal percentage in 20.1 minutes. • Started 21 of 35 games. • Scored in double-figures 13 times and had 10 or more rebounds six times. • Took part in the Clippers Teamwork at the Table Thanksgiving event at St. Joseph Center in Venice where he helped distribute food baskets and turkeys to over 300 families during the 2013-14 season. • Hosted a basketball clinic at a local elementary school in October 2014. • Hosted local youth from Houston when the Clippers played in Houston during the 2014-15 season and participated in post game meet and greet with the group. • Worked with the Salvation Army Siemon Family Youth and Community Center to distribute gifts to children during the holiday season. • Hosted local youth at home games during the 2014- 15 season as part of his PlayerZone. 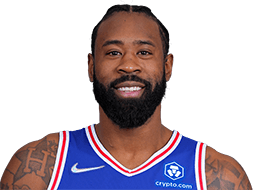 • Full name is Hyland DeAndre Jordan, Jr.
• Majored in general studies. • Named an Official Honoree in the Sports Category for the 13th Annual Webby Awards, for his “Jordan’s Journal” blog on Clippers.com during the 2008-09 season. • Hometown is Bellaire, Texas. • Participated as a member of Team USA in 2007 U-19 World Championships in Serbia. • Was a member of the USA Basketball Junior National Select Team that defeated the World Select Team at the 2007 Nike Hoop Summit held in Memphis, Tennessee. • Averaged 26.1 points, 15.2 rebounds and 8.1 blocked shots his one and only year at Christian Life Center. • Won the 2012-13 “Social/Slam Award” at the NBA’s annual Social Media Awards for his dunk over Brandon Knight on 3/10/13.